Some of the first 2019 iPad mini reviews are going online, with the apparent consensus that while it's the best small-sized tablet on the market, it's merely an evolution meant to keep the Mini relevant. "The decision to get an iPad mini is simple: do you want a small, capable tablet? If you do, the mini is obviously worth $399, especially when you consider how long Apple has supported iPads for in the past," The Verge concluded. "There's just nothing else like it." It pointed out however that the Mini's external design has been virtually unchanged for almost seven years, and that "all the changes to this new Mini are on the inside," referring to things like its A12 processor, True Tone display technology, and increased storage. It also criticized the use of a Lightning port instead of USB-C as on the iPad Pro, and the fact that the tablet only works with the first-generation Apple Pencil, not the second. Wired called the tablet an "eight-inch bundle of contradictions," seemingly "a product borne from an operations meeting about ways in which to use up existing components." Like The Verge, the magazine criticized relatively thick bezels, and the restriction to the first-gen Pencil. "Here's the thing about iPad mini, though: Most of this won't matter," it proposed. "The iPad mini is about emotion. It's not the most popular iPad that Apple makes -- that title goes to the 9.7-inch model -- but the people who are gonna buy it are gonna buy it. "Did you love an earlier version of iPad mini? Sold." 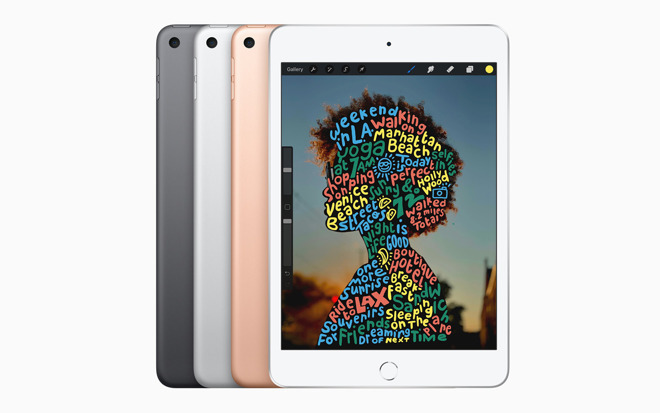 The business network put more emphasis on comparisons with the 2019 iPad Air, saying the Mini is "for people who want a smaller iPad with all of the power of the new iPad Air," of which it thinks there are plenty, even if they may not know it. It remarked though that the Air is "only" $100 more and has a 10.5-inch display, and that the budget-conscious can simply pick up last year's 9.7-inch model for $329. The latter is likely even cheaper as a refurb or through third-party vendors. The Mini's true popularity is in "industrial, commercial and medical applications," and this is a major reason why Apple chose to update the tablet, TechCrunch suggested. It nevertheless enthused about the tablet for average person, saying it's "clearly obliterating anything else in its size class." Some minor criticisms included the lack of a tap-to-wake function, and a "chunky" $399 price, though it added that "if you want the best you pay for it." In contrast with TechCrunch, Engadget's reviewer said he's "just not convinced it's the right tablet for most people," even if it's portable and there's "more than enough power." Like CNBC he called attention to the two other lower-cost iPads available, saying "either of those options seem like more sensible choices." He also described the new Mini's design as "a little dated," and disappointing given the three-plus years since the Mini 4. "The iPad mini is not a revolutionary new tablet," Mashable noted, "but it is a very reliable tablet, and for a certain kind of user, that's more important than a thinner profile and slimmer bezels." It painted the 2019 Mini as "still mostly the same tablet as the iPad mini 4," even compatible with prior accessories. Regardless its blend of compact size and performance makes it worth it, the site said. Laptop asserted the new Mini could be useful to "younger kids who are not yet ready for a phone," as well as executives and "creatives," the latter getting a convenient digital sketchbook. "With the new iPad mini, Apple has given its slate enough oomph to justify the device's $399 price," it wrote. It did however cite a "disconnect between the iPad mini's modern specs and its throwback design," pointing out that Apple could've offered up an 8.5-inch display with thinner bezels. The Android tablet universe is an abysmal circle jerk. Android tablets are irrelevant. The only tablet on the market that's worthwhile is the iPad. Apple owns this market, period. I last bought my mini in March of 2014. I was waiting for this to be released. I like the small form factor; I did not need pencils or any of the latest and greatest. Already purchased . . . True however there is a lesser need for iPad specific apps. iPad is also falling into a browser/email content consumption platform, it needs fuller apps. Did we read the same article? Android tablets weren't even mentioned once. What do they have to do with anything? I think there will be an iPad mini update much sooner next time and it will have a more modern look to it, though probably still not Pro level features. That would do me fine. But I won't wait and will get the m5 and a Pencil. I don't know that an iPad or any tablet can be revolutionary at this point, at least not until it can project holograms of do X-rays. (AR is the new 3D). Incremental, evolutionary updates are all I would expect. I guess it's supposed to give a tech reporter cred when they drop the evo, not revo bomb. Apple may “own” the tablet market in the US but Android remains relevant. It all depends on what you need the tablet to do... You sound Apple Only, while I’ll consider whatever’s available. I consider tablets to be in the “mature tech” category. If you break it, you replace it. But, there isn’t a “must have” feature in the new tablets to create a need that didn’t already exist. One thing Apple did address with the new lineup was improved pricing range. The area it didn’t address was appearance, it has a stale design. I agree with reviews on that. I would have liked to see reduced bezels and an in-screen biometrics. Anyone else think that releasing the mini and making the air 10.5 sets us up in the near future for a folding iPad Air that has the 10.5 screen size with a mini form factor? Been dreaming about that for a while. For me the iPad mini 5 allows me to go back to the moleskine days of taking notes and sketching while also bringing along a fully functioning computer with me. I’ve been waiting for this for a while. Until Apple decides to include Face ID throughout the mobile lineup, the lack of a design change for non-Face ID products makes perfect sense. The new iPad Mini is certainly an improvement over the old one — but how could it not be? However it does seem like a rather lazy effort on Apple's part. Count me among those who think it should have had narrow bezels and a bigger screen within the same footprint. That would have been a delight, instead of merely adequate. 90% of the people interested in either of these devices isn't going care about most of what these reviews think they lack. The main point is to make them capable of running most of today's (and tomorrow's) software. That's it. Apple wants people to upgrade to the A12 and give them the option of using (and buying) an Apple Pencil. And the other point is to create a product line that covers different price points and feature sets. The "fancy" new tech has always been reserved for the top end of their product lines. Yes, eventually it moves down, but usually not until there's a significant gap between the lines. To support the Pencil 2, Apple would have to flatten the edges, a la the Pro. To support thinner bezels, Touch ID has to go, and therefor Face ID would be required. So you would basically end up with cheaper Pro models. And the argument about lacking USB-C... seriously?! If it had USB-C the reviewers would complain that they couldn't use older Lightning cables/devices. Evolutionary isn't a bad to me. These have been generally solid designs and I'm glad Apple is back into the incremental update bidness for their existing products. It is a sucker’s buy with only 3GB of RAM inside! The 2015 Mini 4 has 2GB of RAM inside already! LOL! Upgrade only if you are in need of the pencil! Otherwise, wait a year or two for a 4GB upgrade like Apple did with the Mini 3 to make Mini 4! Apple now does Mini upgrades every 5 years! 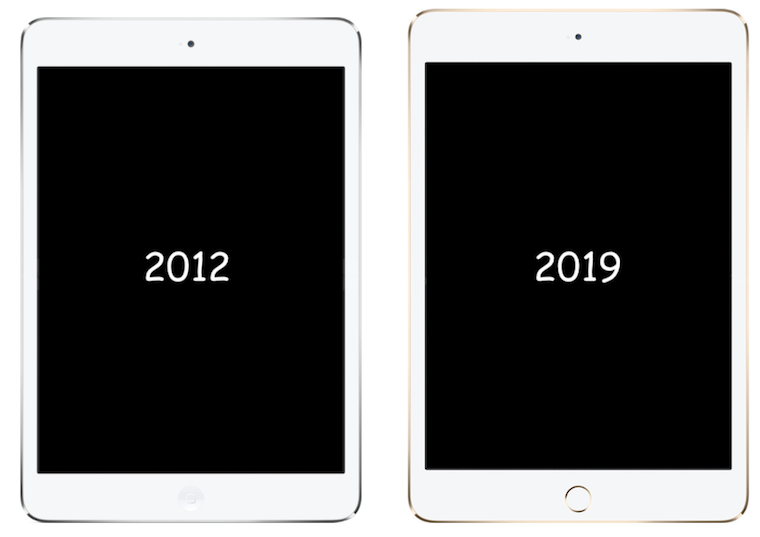 The evolution of the iPad mini design. Interesting.... Apple takes heat when they don't update projects regularly. Apple takes heat if updates are incremental. So the group mentality is that Apple is supposed to reinvent every product every year? Over the last year or so Apple has updated almost all of the projects that they had let get stale. Especially the Mac lineup. Things seem to be humming along quite nicely. ...revolutionary products are few and far in between. Continually polishing is great because whenever you are ready to upgrade, which is typically not every single year/iteration, the consumer gets all the iterative improvements. improvement, there aren't many other striking advances (use of the lesser pencil is only marginally attractive to my purposes). Primarily - but not solely - it will serve as my best ebook reader, Kindles being a glitchy, pathetic, unreliable excuse for a tablet. and look forward to obtaining one (as soon as I can distract my wife into looking "over there!!!"). As for using an iPad Mini like a Moleskine, has everyone forgetten about BlueTooth Styluses? I’ve been using BT Styluses since my iPhone 4S and iPad Mini 1. I got the First Gen Apple Pencil with the First Gen (9.7) iPad Pro. In my experience it does not offer much more functionality to a generic BT Stylus. These days a functional BT Stylus is under $10, while higher end styluses with different tips and such are under $100. I'm very disappointed in the Mini 5's memory options. 64 GB is not enough memory for the base configuration. I have the same gripe with the iPhone X and Xs. Why are the only two choices so far apart? I realize it's an up-sell gimmick by Apple, but it doesn't make it any more palatable. Frankly, it looks like a money-grab to wring out the last few dollars of profitability. For the record, I'm an Apple shareholder and want the company to be profitable. I also want them to give the best value possible to the tens of millions of users of these devices, and being chintzy with memory in the new Mini and existing X/Xs isn't the way to to do it. The base configuration should be 128 GB, on all devices, including the Mini and X/Xs. Considering the price being charged for them, the difference in added expense to Apple would be minimal, and it would go a long way to justifying the more expensive prices. So today I'm speaking with my wallet. I would have upgraded my wife's iPad Mini 4 yesterday if it wasn't for this issue. I'll wait it out for Amazon, B&H or Adorama to put it on sale, or get a refurbished one when they show up on the Apple website.